Nom Eats @ BlackbirdGo KWNK Magpie MEGA PARTY! Let's get our party on with BlackbirdGo KWNK and Magpie Coffee Roasters on March 31st from 3-7pm! 1715 S Wells Reno NV! Come join us in raising funds for the awesome Team Lily Foundation (http://www.teamlillyfoundation.org/)! We'll be there from 11am-2pm! 7777 White Fir Reno NV! Wednesday party at Statewide Lighting (1311 S Virginia St Reno NV)! Art's cool, you should probably come check some out/buy some! 1108 California Reno NV! Seriously...we love that bean water. Let's show Bibo how much we love bean water...and buy it all, maybe some gelato too? 717 S Center Reno NV! Come out to The Holland Project (140 Vesta Reno NV) for All In 2018, where we'll be serving up some awesome burritos! 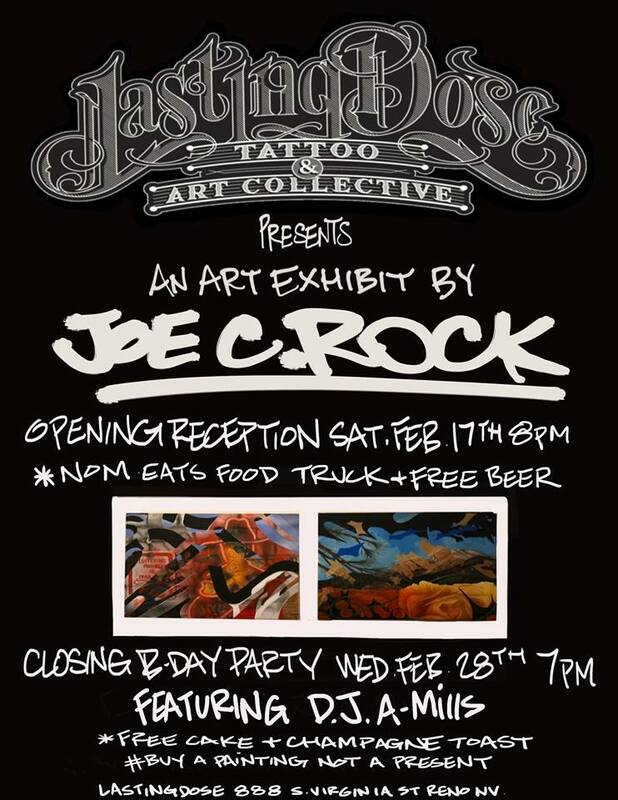 Tons of rad art...get there early and buy it all! We love coffee, you should too! Get over to Magpie and grab some coffee while you get down on some burritos! 1715 S Wells Reno NV! Party with Werewolf Club, Special Explosion, The Co Founder, and Pink Awful! Get on down to 140 Vesta Reno NV...where we'll be serving up burritos from 7-9pm! Sunday morning party at Magpie Coffee Roasters (1715 S Wells Ave Reno NV)! Come party with us at Statewide Lighting (1311 S Virginia St Reno NV)! Come spend a lazy Sunday with us and Magpie Coffee Roasters at 1715 S Wells Ave Reno NV! It's Valentine's Day!! So come party with us at Statewide Lighting (1311 S Virginia St Reno NV) where we'll be doing the cooking for you. It doesn't get anymore romantic than vegan burritos?! Am I right?! Punk Rawk Flea Market! 1240 Icehouse Ave Sparks, NV! Early Dinner Party at P House! Lunch party at Magpie Coffee Roasters (1715 S Wells Reno NV)! Nom Eats @ Holland Project - People with Bodies, Fine Motor, Pry, Surly - Our Center Benefit! Saturday January 27th we'll be at The Holland Project (140 Vesta) with People With Bodies, Fine Motor, Pry, and Surly for a benefit gig for Our Center, so come out: grab burritos, listen to tunes, and donate thangs!! It's gonna be super bodacious. Friday January 26th catch us at Reno Public House (33 St Lawrence Ave) from 8-10pm bringing all the burritos, while they pour up all the libations! Sunday January 21st we'll be at Magpie drinking coffee and making burritos from 12-3pm, so you should probably stop by. 1715 S Wells Ave Reno NV! Saturday we'll be at an open house for the new Good Luck Macbeth location (124 West Taylor St Reno NV) from 5-7pm!! Catch us Friday January 19th at the Holland Project (140 Vesta) shaking our groove makers while burritos are being produced from 7-9pm! You like coffee? We love coffee...burritos too. Saturday January 13th we'll be at 1864 Tavern (290 California Ave) with NVme for their new clothing line debut!! The party starts at 2 and goes until 6pm, so come check out all the new threads, the burritos, and the brews. It's Friday January 12th, and that means we're at Reno Public House (33 St Lawrence) from 8-10pm, so let's party!! New year, new you, same burritos. Wednesday January 10th catch us at Bibo Coffee Co (945 Record St). School may be out, but that doesn't mean the party has to stop! 12-2pm let the party commence.